"Our sea is in the air"
The Czechoslovak Air Force (Československé letectvo) or the Czechoslovak Army Air Force (Československé vojenské letectvo) was the air force branch of the Czechoslovak Army formed in October 1918. The armed forces of Czechoslovakia ceased to exist on 31 December 1992. By the end of the year, all aircraft of the Czechoslovak Air Force were divided between the Czech Air Force and the Slovak Air Force. On 30 October 1918, the establishment of Aviation Corps (Letecký sbor) marked the beginning of the Czechoslovak Air Force. Under the First Republic, the air force was an integral service of the Czechoslovak army. During peacetime, the army aviation was a subordinate agency of the Ministry of National Defence within its 3rd Department of Aviation (III. odbor (letecký) Ministerstva národní obrany) under the command of divisional general Jaroslav Fajfr (as of October 1938). It was anticipated that individual squadrons and flights would be attached to various field corps and divisions in case of war with Germany. In mid-1950s, following the example of Soviet Air Defence Forces, the State Air Defence (Protivzdušná obrana státu, PVOS) was formed alongside the Air Force. In 1976, the State Air Defence formed its own command (1976–1990). In May 1990, the State Air Defence (PVOS), Air Defence of Ground Forces and Frontline Aviation were merged to form an integrated branch of the armed forces – the Czechoslovak Air Force and Air Defence. When the First Czechoslovak Republic was founded in October 1918 it was landlocked and surrounded by potentially hostile neighbours. Its government realised the need for an air force, and quickly founded one with the motto "Our sea is in the air". From Austria-Hungary the new republic inherited only three military airfields and a handful of Hansa-Brandenburg aircraft. In the First World War few Czechs or Slovaks had served in the Imperial and Royal Aviation Troops or naval air corps, or in exile in the French Air Force or Imperial Russian Air Service. But Czechoslovakia inherited much of Austria-Hungary's manufacturing industry, and quickly developed an aircraft industry. At first it tended to build foreign designs of aircraft and aero engines under license. As the industry developed it designed more aircraft and engines of its own. Czechoslovak aircraft builders included Aero, Avia, Beneš-Mráz, Letov, Praga, Tatra and Zlin. Engine makers included ČKD, Walter and Škoda. Aero (Aero továrna letadel) was in the Vysočany quarter of Prague. Its mixed construction (wood, metal, and fabric covering) and all-metal aircraft were competitive in the early 1930s, but by 1938, only its MB.200 (a licensed Bloch design) was not totally obsolete. Avia (Avia akciová společnost pro průmysl letecký Škoda), a branch of the enormous Škoda Works (Škodovy závody) heavy machinery and military industrial enterprise, was different. Founded in 1919 in a former sugar refinery in the eastern Prague suburbs of Letňany and Čakovice, Avia made entire aeroplanes. Many of its engines were licensed Hispano-Suiza designs. It build the standard Czechoslovak fighter aircraft of the late 1930s, the B-534, of which a total 568 were built. The B-534 and its derivatives were among the last biplane fighters in operational use. The state-controlled Letov factory (Vojenská továrna na letadla Letov) was also in Letňany, where in the late 1930s it employed about 1,200 people. It built the Š-28 reconnaissance and army co-operation biplane, of which more than 470 were made. The entire airframe was welded together, not bolted or riveted. The Letov factory was the only Czechoslovak plant that made metal propellers. By the late 1930s Czechoslovakia's bomber aircraft were obsolescent and the speed with which Nazi Germany was becoming a threat did not give Czechoslovak manufacturers enough time to develop a new bomber of their own. So in 1937 the government bought Tupolev SB twin-engined medium bombers from the Soviet Union, plus a license to build more in Czechoslovakia as the Avia B-71. 60 Soviet-built SB bombers were delivered in April and May 1938. This was followed by Avia and Aero building 101 of the B-71 version. The training of air force recruits had developed from a course of several months in the 1920s to two years by the late 1930s. In 1936 Reichsmarschall Hermann Göring wrote "The Czechoslovak Air Force must be considered as one of the leading air forces as regards personnel, and, considering its limited financial possibilities, more than satisfactory with regard to material and equipment". As the Sudeten crisis with Germany worsened, the Czechoslovak Army and Air Force partly mobilised on 21 May 1938 and fully mobilised on 23 September. The air force had more than 100 airfields and 1,300 aeroplanes, of which 650 were front-line aircraft. But on 29 September the United Kingdom and France agreed to let Germany annex the Sudetenland, which German forces then did without Czechoslovak armed forces being allowed to resist. The Munich Agreement was followed on 2 November 1938 by the First Vienna Award, in which Germany and Fascist Italy allowed Hungary to annex southern Slovakia. Then on 15 March 1939 Germany occupied Czechoslovakia, created the Protectorate of Bohemia and Moravia rump state and allowed what remained of Slovakia to become the Slovak Republic. Germany allowed Slovakia to keep a small army and air force, but it ordered the puppet government of Bohemia and Moravia to dissolve its armed forces. The Luftwaffe confiscated all Czechoslovak Air Force aircraft. All Czechoslovak aircraft factories were converted to produce German aircraft and engines. The Luftwaffe tried to recruit demobilised Czechoslovak airmen to non-combat roles such as ferry flights and meteorological flights, but without success. It also confiscated Czechoslovak aircraft and tried to get Czechoslovak airmen to fly them to Germany. But of seven Czechoslovak pilots who took off from Hradec Králové airfield in Moravia, none reached Germany. Three flew to Poland, two reached the USSR and the other two crash-landed their aircraft, without injuring themselves but rendering their aircraft beyond economic repair. Thereafter Germany gave up trying to use Czechoslovak airmen. Emigration was strictly controlled and former air force personnel were not allowed to leave the country. But many Czechoslovak airmen got themselves smuggled into Poland. Of these a few joined the Polish Air Force but most continued to France. Czechoslovak pilots who joined the Polish Air Force went into action in September 1939 when Germany invaded Poland. Many fought with distinction and 55 were decorated. Josef František was among those awarded Poland's highest military decoration, the Virtuti Militari. After the USSR joined the invasion of Poland its forces captures some Czechoslovak airmen. Others escaped as Poland fell, first reaching Romania and then going via the Balkans and Syria or Lebanon to join their compatriots who had already reached France. At first France insisted that all Czechoslovak airmen join the Foreign Legion. Only after France had declared war on Germany did it agree with the Czechoslovak National Committee in Paris to let the men transfer to the French Air Force and restore their ranks. They needed to be re-trained to fly French aircraft, but some completed their training in time to fight in the Battle of France in May and June 1940. Of these, seven were awarded France's highest military decoration, the Légion d'honneur, and five received the Médaille militaire. 70 Czechoslovak airmen, including Josef František and Karel Kuttelwascher, were awarded the Croix de Guerre. After France capitulated to Germany on 22 June 1940, many Czechoslovak airmen escaped via either France's Atlantic or Mediterranean coasts or from French North Africa. They reached the United Kingdom, where Brigadier General Karel Janoušek quickly secured an agreement with the UK War Department for them to join the Royal Air Force Volunteer Reserve (RAFVR). On 12 July 1940 an Inspectorate of the Czechoslovak Air Force was established, with Janoušek as Inspector-General with the RAF rank of Air Commodore. A Czechoslovak depôt was created at RAF Cosford in Shropshire. The RAF quickly created new squadrons formed of Czechoslovak pilots. The first fighter unit was No. 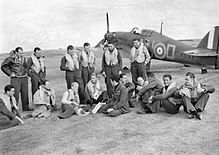 310 Squadron RAF, which was formed on 10 July 1940 and immediately joined in the Battle of Britain. By the end of July a bomber unit, No. 311 Squadron RAF, had been added. Further Czechoslovak fighter units followed: 312 Squadron by August 1940 and 313 Squadron in May 1941. I must confess that I had been a little doubtful of the effect which their experience in their own countries and in France might have had upon the Polish and Czech pilots, but my doubts were soon laid to rest, because all three squadrons swung in the fight with a dash and enthusiasm which is beyond praise. They were inspired by a burning hatred for the Germans which made them very deadly opponents. From 1940 until 1942, 311 Squadron was part of a Bomber Command group. The Group commander said 311 "put up a wonderful show" and had "the finest navigators in Bomber Command". Seven pilots of 312 Squadron at RAF Harrowbeer in Devon, just after President Edvard Beneš has decorated them. Five wear the Czechoslovak War Cross 1939–1945 and four wear what appears to be the Československá medaile Za chrabrost před nepřítelem ("Czechoslovak Medal for valor in face of the Enemy"). A preponderance of air force personnel who escaped from occupied Czechoslovakia were aircrew. The RAF had a shortage of Czechoslovak ground crew, so the new squadrons continued to rely in part on ground crew from the UK and other nationalities. And numerous Czechoslovak airmen were posted to more than 60 other RAF units, including 11 front-line squadrons. Enough Czechoslovaks were posted to No. 68 Squadron to form an entire flight. 68 squadron even adopted a Czech motto, Vždy připraven ("Always ready"). Czech fighter ace Josef František, acclaimed by one wartime author as "the greatest of all Czechoslovak pilots, perhaps one of the greatest fighters of all time", served in the Battle of Britain in No. 303 Polish Fighter Squadron. Karel Kuttelwascher, a night fighter ace nicknamed the "Night Reaper", served in No. 1 Squadron. Other Czech and Slovak pilots fought against Germany under Soviet command. After the German partition of Czechoslovakia in 1938, Slovakia was left with a small air force (Slovenské vzdušné zbrane or SVZ) equipped primarily with Czechoslovak aircraft. In 1939 the SVZ defended Slovakia against Hungary in the Slovak–Hungarian War, and fought alongside German forces in the Slovak invasion of Poland. In the German invasion of Russia the SVZ provided air cover for Slovak forces fighting against the USSR on the Eastern Front. During the campaign Slovakia’s obsolete biplanes were replaced with German combat aircraft, including the Messerschmitt Bf 109. The air force was sent back to Slovakia after combat fatigue and desertion had reduced the pilots' effectiveness. Slovak air units took part in the Slovak National Uprising against Germany from late August 1944. Farewell parade of Czechoslovak squadrons at RAF Manston, Kent, on 3 August 1945. Air Marshal John Slessor, with walking stick, inspects some of the men. Air Marshal Janoušek can be seen behind him. Towards the end of the Second World War, General Alois Vicherek (cs:Alois Vicherek) left Britain for the Soviet Union, where he was supposed to take over command of the Czechoslovak Air Force in the USSR. However, he only arrived on 1 May 1945, when the war was almost over. Vicherek was happy to serve an Eastern Bloc Czechoslovakia, and on 29 May 1945 he was appointed the Commander of the Czechoslovak Air Force. In August 1945 the RAF's four Czechoslovak RAF squadrons, numbers 310, 311, 312, and 313 all relocated to Czechoslovakia and became part of the Czechoslovak armed forces. By then 310, 312 and 313 squadrons were equipped with Supermarine Spitfire Mk IX aircraft and 311 Squadron was equipped with Consolidated B-24 Liberator heavy bombers. The Spitfires were flown to Czechoslovakia with long range "slipper" fuel tanks to give them enough range for the journey. Under German occupation, Aero and Avia had built Messerschmitt Bf 109 fighters for the Luftwaffe. In order to expand Czechoslovakia's fighter complement beyond the three squadrons of Spitfires transferred from the UK, Avia continued building the Bf 109 as the Avia S-99. However, an industrial accident soon destroyed Avia's remaining stock of Daimler-Benz DB 605 aircraft engines, so Avia substituted the Junkers Jumo 211 engine and associated propeller. The resulting hybrid aircraft was called the Avia S-199. The Jumo engine and propeller had been made for medium bombers and had the wrong performance characteristics for a fighter aircraft. This gave the S-199 poor handling, particularly during take-off and landing. Production ended in 1949 and Czechoslovakia withdrew its last S-199 aircraft from service in 1957. From 1945 the Air Force also had 56 Soviet-built Lavochkin La-7 fighters, which were quicker and manœuvred better than the Bf 109 and S-199. The Spitfires were Czechoslovakia's primary fighter aircraft until the 1948 Czechoslovak coup d'état, after which the Communist Party of Czechoslovakia purged air force personnel who had served in the RAF. Many ex-RAF personnel, including Air Marshal Janoušek and Hawker Hurricane pilot Josef Bryks, were tried on false charges and given long prison sentences. In 1955 Czechoslovakia became a founder member of the Warsaw Pact. The Czechoslovak Air Force was equipped with Soviet aircraft and followed its doctrines and tactics. Mostly Mikoyan-Gurevich aircraft (MiGs) were bought. MiG-15, MiG-19, and MiG-21F fighters were produced under licence; in the 1970s, MiG-23MF were acquired, followed by MiG−23MLs and MiG-29s in the 1980s. In 1951 the 1st, 2nd, and 3rd Air Defence Districts of State Territory were created, at about the same time as the creation of the 15th Fighter Air Corps. The 15th Fighter Air Corps controlled the 1st, 3rd, 5th, and 166th Fighter Air Divisions at various times; the 166th Fighter Air Division later became the 2nd Fighter Air Division. From 1964 to 1969 the 10th Air Army included the 46th Transport Air Division, of two regiments of helicopters and a transport regiment. Reportedly from January 1976, the 7th Air Army was disbanded and replaced by the State Air Defence Command with the 2nd and 3rd Air Defence Divisions, which existed until 1990. The State Air Defence Command moved from Prague to Stará Boleslav in 1981. In May 1987 two Czechoslovak Air Force jets were scrambled to try to bring down a Czechoslovak engineer attempting to escape his home country via a home-built ultralight aircraft. After flying about 10 miles (16 km) to the West German border, the refugee's aircraft ran out of fuel, and he landed safely in a Bavarian forest, just before the Czechoslovak fighters could intercept him. In the 1980s and early 1990s the Czechoslovak Air Force consisted of the state air defence command, with air defence fighters, surface to air missiles, and air defence radars, and the 10th Air Army, responsible for ground forces support. The state air defence command had 2nd Air Defence Division (Brno) with 8th Fighter Air Regiment, radars, and surface to air missiles, and the 3rd Air Defence Division (Žatec) with the 1st (České Budějovice), 5th (Dobřany), and 11th Fighter Air Regiments (Zatec), and the 71st Anti-Aircraft Missile Brigade and 185th Anti-Aircraft Missile Regiment. 8th Fighter Air Regiment was based at (Ostrava) (Mošnov) from 1959 until 1 April 1985, whereupon it relocated to Brno (Tuřany). It was equipped with the MiG-21 from 1965 to 1991. 1st Fighter Air Regiment at České Budějovice was equipped with MiG-21s from 1964, and was disbanded in 1992. The 10th Air Army had two air divisions and a total of six regiments of fighters and attack aircraft. There were also two reconnaissance regiments, two transport regiments, three training regiments, and two helicopter regiments. In 1990 the 10th Air Army, with headquarters at Hradec Králové, comprised the 1st Fighter Air Division (HQ Bechyně, included the 9th Fighter Air Regiment at the same base until 30 June 1990), the 34th Fighter Bomber Air Division (HQ Čáslav), the 47th Reconnaissance Air Regiment (Ostrava-Mošnov), the 10th Signal Regiment, the 11th Helicopter Regiment, the 1st Composite Transport Air Regiment, and the 30th Attack Air Regiment (Pardubice Airport, with Su-25Ks). It was disbanded on 1 October 1990 and succeeded by the 1st Mixed Air Corps. 46 Bomber Division (46. letecká bombardovací divize) between 1951 and 1955. 24 Bomber Regiment (24. letecký bombardovací pluk) between 1952 and 1954. 25 Bomber Regiment (25. letecký bombardovací pluk) between 1952 and 1954. 17 Fighter Regiment (17. stíhací letecký pluk) between 1955 and 1964. 26 Fighter Regiment (26. stíhací letecký pluk) between 1956 and 1958. 30 Fighter-Bomber Regiment (30. stíhací bombardovací letecký pluk) between 1958 and 1959. 2 Fighter-Bomber Regiment (2. stíhací bombardovací letecký pluk) between 1964 and 1968. In November and December 1989 the Velvet Revolution ended Communist rule in Czechoslovakia. In 1992 the Slovak Republic voted to leave the federal republic, which was dissolved on 1 January 1993. The assets of the former air force were divided 2:1 in the Czech favor, and thus the Czech Air Force and the Slovak Air Force were formed. The 18 MiG-29s then in service were divided 1:1 between the new countries. A 1992–93 reorganisation resulted in a completely new structure of the Czech Air Force which came into effect in 1994. One of the first units which closed down as a direct result of the transfer of a large number of aircraft to Slovakia was the 9th Fighter Bomber Air Regiment (9. SBoLP) at Bechyně. ^ Ludikar, Marcel (2014-09-18). "A short history of the Czechoslovak Air Force in WW2 and the Post-War Period". Free Czechoslovak Air Force. Archived from the original on 2017-10-13. Retrieved 29 December 2017. ^ "Čs. armáda po roce 1945". Československé vojenství. Václav Bartoš, Pavel Minařík, Pavel Šrámek a kol. Archived from the original on 2015-10-29. Retrieved 29 December 2017. ^ Tomek, Prokop. "Rozdělení čs. armády na přelomu let 1992/1993 proběhlo nebývale hladce". VHU.cz. Vojenský historický ústav. Archived from the original on 2017-12-30. Retrieved 29 December 2017. ^ Macoun, Jiří (2007). České vojenské letectvo. Prague: Computer Press. p. 5. ISBN 978-80-251-1825-2. ^ Fidler, Jiří (2015). Na zrazeném nebi. Prague: Libri. p. 411. ISBN 978-80-7277-532-3. ^ a b c Dúbravčík, Jan (2016). "Reakce na článek "Několik poznámek k terminologii v rezortu MO"". Vojenské Rozhledy (in Czech) (1). ISSN 2336-2995. ^ a b Vystavěl, Stanislav. "Velitelství". Vrtulník.cz. Archived from the original on 2017-12-30. Retrieved 29 December 2017. ^ "Velitelství letectva hlavního štábu [1945–1950]". Válka.cz. Archived from the original on 2017-12-30. Retrieved 29 December 2017. ^ "Velitelství letectva [1950–1957]". Válka.cz. Archived from the original on 2017-12-30. Retrieved 29 December 2017. ^ "Velitelství letectva a protivzdušné obrany státu [1957–1966]". Válka.cz. Archived from the original on 2017-12-30. Retrieved 29 December 2017. ^ "Hlavní správa letectva a vojsk protivzdušné obrany státu [1966–1969]". Válka.cz. Archived from the original on 2017-12-30. Retrieved 29 December 2017. ^ "Správa letectva a vojsk protivzdušné obrany státu [1969–1976]". Válka.cz. Archived from the original on 2017-12-30. Retrieved 29 December 2017. ^ "Velitelství protivzdušné obrany státu [1976–1990]". Válka.cz. Archived from the original on 2017-11-07. Retrieved 2 January 2018. ^ "Velitelství letectva [1976–1990]". Válka.cz. Archived from the original on 2017-12-30. Retrieved 29 December 2017. ^ "Velitelství letectva a protivzdušné obrany státu [1990–1991]". Válka.cz. Archived from the original on 2017-12-30. Retrieved 29 December 2017. ^ "Velitelství letectva a protivzdušné obrany [1991–1992]". Válka.cz. Archived from the original on 2017-12-30. Retrieved 29 December 2017. ^ Janoušek 1942, p. 3. ^ a b Janoušek 1942, p. 4. ^ a b Janoušek 1942, p. 7. ^ a b Janoušek 1942, p. 8. ^ a b c "RNDr Air Marshall Karel Janoušek". Free Czechoslovak Air Force. 8 May 2012. Archived from the original on 2016-03-04. Retrieved 3 November 2017. ^ a b Janoušek 1942, p. 14. ^ a b c Janoušek 1942, p. 17. ^ "Josef František – One of the Few". Free Czechoslovak Air Force. 24 July 2010. Retrieved 3 November 2017. ^ Janoušek 1942, p. 19. ^ a b Janoušek 1942, p. 20. ^ Dowding, Hugh (10 September 1946). "The Battle of Britain". The London Gazette. pp. 4553–4554. Archived from the original on 2018-01-13. Retrieved 2017-11-04. ^ Janoušek 1942, p. 12. ^ Janoušek 1942, p. 23. ^ a b Janoušek 1942, p. 24. ^ "Karel Kuttelwascher – One of the Few". Free Czechoslovak Air Force. 1 January 2011. Archived from the original on 2017-10-13. Retrieved 3 November 2017. ^ "Josef Bryks". Free Czechoslovak Air Force. 20 February 2011. Archived from the original on 2017-10-25. Retrieved 3 November 2017. ^ "46th Transport Airborne Division". Valka. ^ "Chronologie výstavby". Čzeskoslovenská armáda. 9 April 2006. Archived from the original on 2013-06-29. ^ "Man escapes in hang glider". The Register-Guard. 20 May 1987. p. 2A. Archived from the original on 5 November 2018. Retrieved 20 September 2016. ^ "State Air Defense Command". Valka. Archived from the original on 2012-04-11. ^ Oliver, David, ed. (1991). Eastern European Air Power. AFM Airpower. 3. Stamford: Key Publishing Ltd. pp. 38–41. ^ "10th Air Army". Valka. Archived from the original on 2013-12-20. ^ V, Ronald (5 February 2012). "Czech Republic, kraj: Liberec: Hradcany". Abandoned & Little-Known Airfields. Archived from the original on 2013-01-20. Retrieved 2012-03-23. Janoušek, Karel (1942). The Czechoslovak Air Force. London: Inspectorate-General of the Czechoslovak Air Force. Liškutín, Miroslav A (1988). Challenge in the Air: a Spitfire pilot remembers. London: William Kimber. ISBN 978-0718306915. Titz, Zdenek; Davies, Gordon; Ward, Richard (1971). Czechoslovakian Air Force, 1918–1970. Aircam Aviation Series. S5. Reading: Osprey Publishing Ltd. ISBN 978-0-85045-021-7. "order of battle". Air International: 12. July 1991.